These Weights can be delivered anywhere in the Contiguous United States. Your USA made stoneware weights are shipped from Virginia by UPS to arrive within four to eight business days after receiving your order. 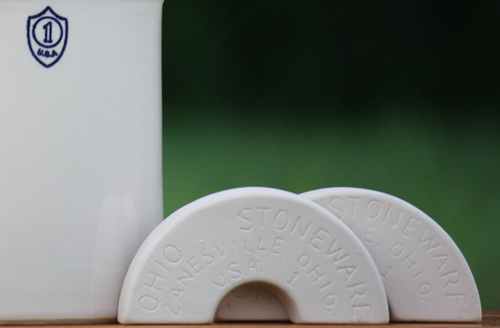 At the ready food safe fermentation crock weights custom built for Ohio Stoneware Fermentation Crocks. These optional sets (of two) semicircle stone weights fit convenient inside the one, two, three, four and five gallon stoneware crocks. These are all you'll need to keep fermenting food submerged for proper lactic acid fermentation, which requires no oxygen to successfully occur. Click to read more about crock lids. Made in America by the Ohio Stoneware company.